Read more "Mucho se demandará de él"
Read more "Random Encouraging Thoughts"
Read more "Fun Fact of Ketogenic Diet No. 3"
Read more "7 day water fast"
Read more "Heaven or Hell"
In the last post I discussed some of the potential benefits of a Ketogenic diet on neuroinflammation. Hopefully you read that post, high fived yourself, read my post on a specific diet plan, and then began writing up a diet plan for yourself or using the one I provide. 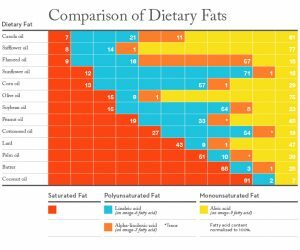 This post is about the detail of the ketogenic diet. If you look at this post, you can see that my fat sources are quality eggs, quality bacon, avocado, coconut, and nuts. This means that the fats you are consuming are either saturated or high in omega-3 fat molecules. Of course, since most of your calories are coming from fats, you should make sure that they are high quality. Since the 1960’s, the amount of omega-6 FA (a type of fat molecule) has increased in human fat tissue (samples taken from humans) from under 10% of total fat tissue to about 25% . At the same time, we have seen a shockingly great increase in chronic diseases whether cardiovascular, neurological, or metabolic. These two trends are just a correlation, not a proof of cause, but it does mean that omega-6 is a potential culprit. Most likely, it is a confluence of many things. On the flip side, omega-3 FA has not increased to the same extent. This means the 6:3 ratio has sky-rocketed. Most biologists estimate that our ancestors 6:3 ratio was between 4:1 and 1:4. Today our average 6:3 ratio in the U.S. is around 16:1 . In a study by Delpech et al, one group of mice were given a gene which codes for an enzyme that converts omega-6 FA into omega-3 FA (TG), increasing their tissue levels of omega-3. Another group of mice were not given anything (WT). After exposure to a pro-inflammatory molecule, the TG showed far less inflammation then the WT counterparts . The WT group also showed impaired spatial orientation while the TG group did not. This data shows that a high 3:6 ratio and a low 6:3 could have significant protective effects against neuroinflammation. Take away: Eat foods high in omega 3 FA and fairly low in omega 6 FA. Foods I recommend are avocados, salmon, and cage free eggs. Also, I recommend ALWAYS check the list of ingredients to make sure no strange oil is on the list. I avoid all oils except avocado oil, olive oil, and coconut oil. Source: POS Pilot Plant Corporation. Read more "Fun Fact of Ketogenic Diet No. 2"
Read more "Fun Fact of Ketogenic Diet No. 1"
Read more "A Man Named Balance"
Read more "How to explain your concussion to others with SCIENCE"